Gluts don’t have to mean gluttony. But for a singleton brought up in a Calvinistic home where the suggestion of throwing food away was usually converted into a needless conveyance of barely edible matter through the alimentary tract, I have a hell-fire terror of waste. At this time of year, when those luscious late summer crops are piled high in the market with enticingly low prices, it’s hard not to load the fruit bowl in the vain hope that you’ll actually be minded to eat 3 peaches a day until Michaelmas. Never fear though. 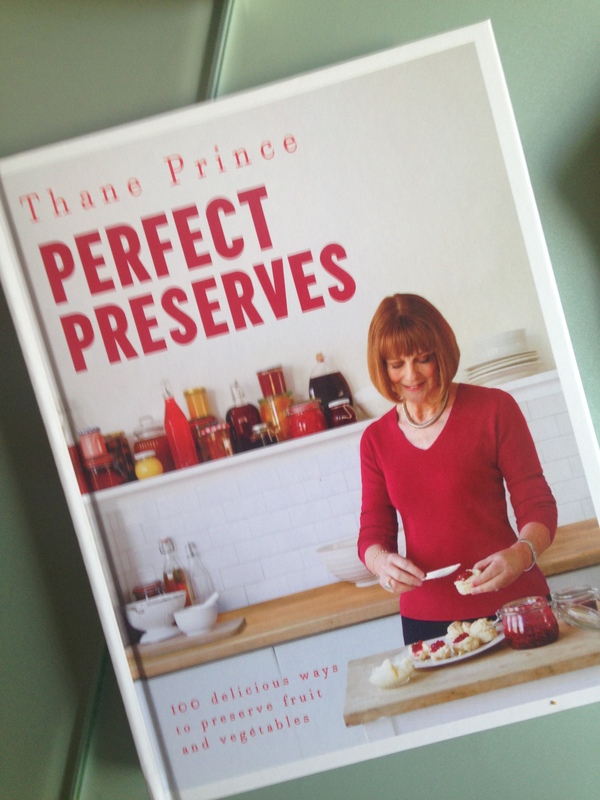 Help is at hand in the form of Thane Prince and her wonderful new book ‘Perfect Preserves’ or as I like to call it, ‘Thane Prince’s Perfectly Preserved’. (Say it out loud. It’s true…never a lovelier woman has walked the byways of Islington). Place the garlic, chilli and ginger in the Thermomix. Blitz at speed 10 for 3 seconds. Scrape down. Add the onions. Speed 5. 6 seconds. Using a pestle and mortar, crush the cardamom pods and remove the husks. Pound the black seeds until they are a powder. Add the peaches to the Thermomix bowl with the cardamom, pepper sat and vinegar. 100C/Reverse Speed Spoon/10 minutes TM on. Check after 20 minutes. If the chutney seems thin, reset for another 5-10 minutes. The Chutney should be syrupy and separate using a spoon. It will firm up as it cools. Sterilise 3 small jam jars and lids in the oven at 100C for 20 minutes. Pour the chutney into the hot jars to the shoulder. Place the lids on top but do not screw closed until completely cold. You can eat this chutney immediately, but it will improve for up to a year. Heat a small frying pan on a medium heat and fry the chorizo until it has just released its oil. Remove from the pan and set aside. Butter two slices of bread. Lay the first slice, butter side down in the same frying pan you used for the chorizo. Gently place the cheese and chorizo on the bread in the pan and place the second slice of bread, butter side up in the pan. Turn over immediately to coat the other side in the chorizo scented oil before one side soaks it up completely. Allow the cheese to melt, turning the sandwich a couple of times until it is golden brown. Serve with the peach chutney and a few salad leaves.